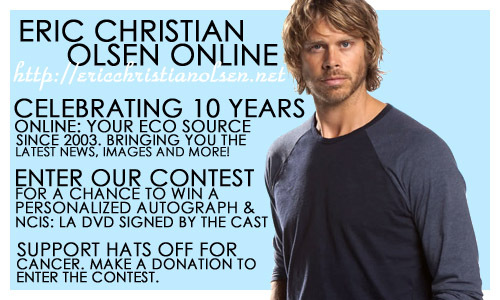 Eric Christian Olsen Online is celebrating its 10 year anniversary this month! And we’re celebrating this incredible milestone with a contest. We will be raising money for Hats Off For Cancer, a charity that Eric supports. And if you make a donation, you will have the chance to win a great prize! I’ve contacted Eric about the contest and he has graciously agreed to send the winner a personalized autograph and a NCIS: Los Angeles DVD signed by the cast. No joke! Eric has supported the site for, well, almost 10 years actually! Please read our guidelines below, make a donation and you could be the lucky winner of this amazing prize! 1) Donate to Hats Off For Cancer via PayPal. You can use the button below. Minimum donation is $4 to enter (*for more info, scroll down). Please note that the money goes directly to Hats Off For Cancer. 2B) Or you can make a screenshot of your payment. Open your favorite Paint program, press PRTSC (or something similar) and then paste or press CTRL+V. Don’t forget to save your screenshot. E-mail your screenshot to gwen@ericchristianolsen.net and please include your name and the amount you’ve donated. This is the only way for me to keep track of who entered the contest and how much money we’re raising. As I mentioned above, the money goes directly to Hats Off For Cancer, so I can’t see who donates and how much money someone donates. 3) I will e-mail you back as soon as possible to confirm your contest entry. 4) The contest runs throughout May so make sure you’ve entered before Saturday, June 1st! That weekend, I will randomly draw a name from a hat and that person will be the winner. If you’re the winner, I’ll mail you to ask for your address so Eric can send you your prize! That’s it! Thanks for reading and I hope you will participate! If you have any questions, please mail me or send me a tweet. *I know that not everybody has a lot of money to spend. These are tough times so I really appreciate every donation we receive for Hats Off For Cancer. We won’t look at the donation amount when picking a winner, so everyone has a fair shot. The reason I do ask for a minimum donation of $4 is that hopefully, at the end of May, we’ve raised a couple of hundred dollars for a great charity. So if you can miss a couple of extra bucks and donate more than $4, well, that would be really great!